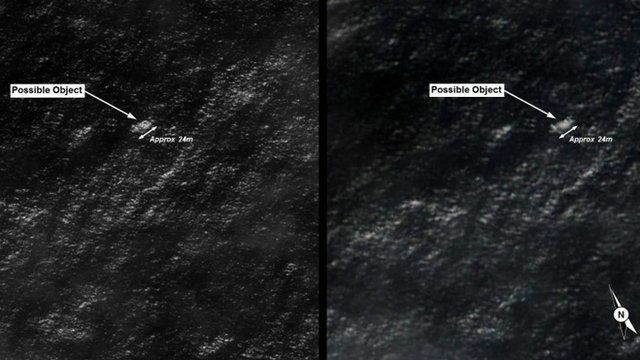 Australia is investigating two objects seen on satellite images that could potentially be linked to the missing Malaysia Airlines plane, officials say. Planes and ships from Australia, New Zealand and the US were heading to the area 2,500km (1,550 miles) south-west of Perth to search for the objects. The largest appeared to be 24m in size, maritime authorities said, but warned they could be unrelated to the plane. 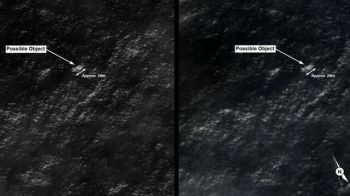 Australia has been searching in the southern Indian Ocean for the aircraft. Malaysia Airlines flight MH370 was flying from Kuala Lumpur to Beijing on 8 March when it lost contact with air traffic controllers. A total of 239 people were on board. Twenty-six nations have been involved in a major search for the missing plane, which Malaysia says was intentionally diverted. Investigators have been scrutinising the backgrounds of both the crew and the passengers, but have so far identified no evidence of terror or other potentially relevant links. A number of sightings of possible debris have been investigated in the course of the search but so far none have proved to be linked. Prime Minister Tony Abbott announced the discovery of the objects in parliament. "The Australian Maritime Safety Authority (Amsa) has received information based on satellite information of objects possibly related to the search," Mr Abbott said. "Following specialist analysis of this satellite imagery, two possible objects related to the search have been identified." An Australian Orion aircraft is currently in the search area and three more planes, including US and New Zealand aircraft, are on their way. A merchant ship is due there later in the day and an Australian naval vessel, HMAS Success, is also on its way. Amsa said the debris had been located in waters some 2,500km south-west of the Australian city of Perth. The objects identified were of a "reasonable size", Amsa's general manager John Young said. The largest object appeared to be about 24m in size, he said. "The objects are relatively indistinct. The indication to me is of objects that are of a reasonable size and probably awash with water and bobbing up and down over the surface," he said. "This is a lead, it is probably the best lead we have right now. But we need to get there, find them, see them, assess them, to know whether it's really meaningful or not." He warned that poor visibility in the area could hamper the search. Australia informed Malaysian authorities of the development on Thursday morning. "We have been following every single lead and this time I just hope that this time it is a positive development," Malaysia's Acting Transport Minister Hishammuddin Hussein said. Earlier this week, Australia was asked by Malaysia to take responsibility for the "southern corridor" search. Investigators had identified two corridors of territory - one to the north and one to the south - spanning the possible positions of the plane about seven hours after take-off. This was based on its last faint signal to a satellite - an hourly "handshake'' broadcast even when the main communication systems are switched off. The plane lost contact with controllers over the South China Sea as it crossed from Malaysian to Vietnamese air space. Malaysian officials say it then turned west and its last position - according to Malaysian military radar - was over the Malacca Straits, in the opposite direction to its planned flight path. Attention has focused on the crew and on Wednesday multiple unidentified US officials said that the FBI was helping Malaysia analyse data from a flight simulator taken from the captain's home. Hishammuddin Hussein, at a press conference on Wednesday, stressed the captain should be considered innocent until proved otherwise and said that members of his family were co-operating with the investigation.